While membership is not restricted to only those who have graduated from a Bachelor of Science Program in Forestry; all members must demonstrate that they have obtained the equivalent qualifications. 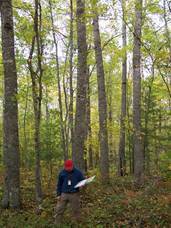 These have been identified nationally as the "Certification Standards for the Practice of Professional Forestry in Canada". (see http://www.cfpfa-fcafp.ca/English/index.html) This will ensure that they have received both theoretical and practical training in all subjects, which should be considered when management recommendations are being made for a parcel of forested land. Following a review of the applicants qualifications by the Registrar, a membership category will be established for the applicant; and a tentative time frame for completing the Jurisprudence exam will be proposed. Legislation relevant to the exam will be available on the website.